Wheelchair seat = 15 16 17 18 19 20 " x 15 16 17 18 19 20 21 22 23 24 "
My chair's rear wheel dia. = 24" 25" 26"
Rear wheel camber = 0-1 1-2 2-3 3-4 4-5 5-6 6-7 7-8 8-9 9-10 deg. I would like 1 2 3 4 5 6 7 8 9 ZX-1 unit(s). 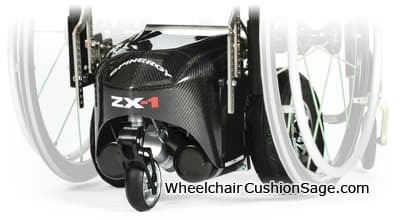 The ZX-1 power assist wheelchair add-on by Spinergy - here - comes with a cushion. The ZX-1 (see larger picture below)is a free-standing, joystick controlled, battery powered accessory for manual wheelchairs. Spinergy - the manufacturer of this product - specifies this power assist device as follows. Will a ZX-1 work for my particular chair? If you're uncertain, email your chair's brand and serial number and get a reply with the answer. This power assist device is made for people who weigh no more than 250 pounds, and who use a manually propelled non-folding (i.e., rigid) wheelchair. Power assist is controlled by an armrest-mounted joystick (see front-view picture below). 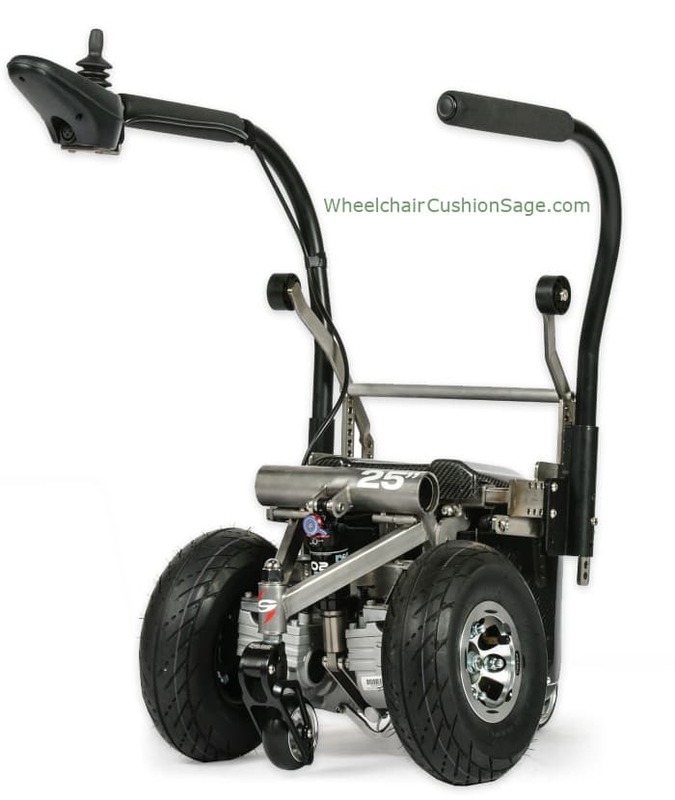 The ZX-1 engages the rear base of the wheelchair by grabbing the chair's axle tube (also called camber tube). Once initially configured, a wheelchair user who can use a manual chair, can use the ZX-1's joystick to engage and disengage the device without assistance. An armrest extension kit is available as an option and may be ordered with a ZX-1 here (above), or separately by sending an email to the address listed on the Email page of this website. The armrest extensions are especially helpful for tall ZX-1 users. The lithium-ion (Li-ion) battery upgrade effectively doubles the original ZX-1's range and reduces its weight by approximately three pounds. The specific lithium-ion battery type is LiFePO4. You can retrofit an existing ZX-1 with the lithium-ion battery upgrade. The retrofit package will include 2 lithium-ion batteries and a new communication cable. Note that the retrofitting task involves re-programming the ZX-1's controller, so you will need access to someone who can re-program your controller. The re-programming enables the joystick module's LED display to warn of the substantially more abrupt power drop associated with depleting Li-ion batteries. Note that the Li-ion upgrade package costs more - separately - than when purchased with a new ZX-1. Re-programming is unnecessary when the ZX-1 is purchased with the Li-ion upgrade. Note also that the shipping weight of the Li-ion retrofit package ia approximately 100 pounds, and is most economically delivered to a business address via regular freight (rather than; for example, UPS and FedEx). Orders can be placed now for the lithium-ion upgrade - retrofit or otherwise. Wheelchair Cushion Sage can deliver a ZX-1 to anywhere in the world except Australia (Spinergy has an exclusivity agreement with its ZX-1 dealers in Australia). free cushion — any Stimulite, Vicair, or Star that you want from this site — comes with this power assist add-on. The cushion is an added benefit provided by Wheelchair Cushion Sage. To get your cushion, contact Wheelchair Cushion Sage with your cushion details and your ZX-1 order ID (found in your receipt) within 72 hours after you order your ZX-1. You will receive a confirmation phone call and the cushion that you specify will be shipped to you free of charge.